Interactable Will this component accept input? See Interactable. Fill Rect The graphic used for the fill area of the control. Direction The direction in which the slider’s value will increase when the handle is dragged. The options are Left To Right, Right To Left, Bottom To Top and Top To Bottom. Min Value The value of the slider when the handle is at its extreme lower end (determined by the Direction property). Max Value The value of the slider when the handle is at its extreme upper end (determined by the Direction property). Whole Numbers Should the slider be constrained to integer values? Value Current numeric value of the slider. If the value is set in the inspector it will be used as the initial value, but this will change at runtime when the value changes. On Value Changed A UnityEvent that is invoked when the current value of the Slider has changed. The event can send the current value as a float type dynamic argument. The value is passed as a float type regardless of whether the Whole Numbers property is enabled. The value of a Slider is determined by the position of the handle along its length. The value increases from the Min Value up to the Max Value in proportion to the distance the handle is dragged. 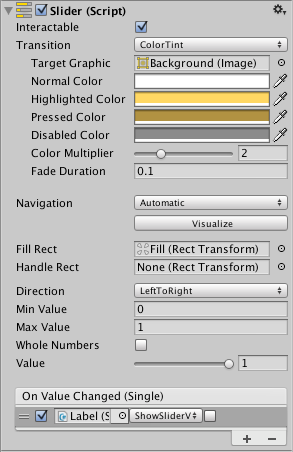 The default behaviour is for the slider to increase from left to right but it is also possible to reverse this behavior using the Direction property. You can also set the slider to increase vertically by selecting Bottom To Top or Top To Bottom for the Direction property. Choosing a level of difficulty in a game, brightness of a light, etc. Setting a distance, size, time or angle.